This extremely rare white game worn team Thailand national team jersey was used by Pongpol Kanchanachongkol in 1998 Asia Oceania U18 Championship tournament. It's a historic jersey because it was a tournament in which the Thai national team performed for the very first time. Please enjoy the tournament description below. Thai team wasn't expected to be in the top end of the standings but instead they finished dead last with maybe the worst performance of modern national team era. Thailand finished dead last 6th place after a single round round-robin. The other participants were South Korea, Japan, China, Australia and New Zealand. Thailand's goal difference was incredible 3-217. That's right. 217 conceded goals in just 5 games. That included blowout games 0-58 against Japan and the legendary 0-92 deficit against South Korea which is still the world record as the biggest win in national team games. It's very likely that it will never be broken. Thailand started the tournament against one of the favourites, Japan. It took only 1.16 for Japan to score their first goal. At the first intermission the score was 17-0 and total shots absolutely murdering 64-0 of which 36 were actual shots on goal. The scoring rally ended breathtakingly only 13 seconds before the final buzzer and the final score was 58-0. Thailand could produce only 1 shot in the whole game while Japan shot 190 times. SOG were 130-1. Japan switched their goalie at half way of the game and in the 3rd period Thailand were able to force the Japanese goalie to stop the puck. Next opponent for Thailand was China. That was expected to be not so big scoring game but the score sheet keeper had still a busy afternoon. China won the game 31-0 and the SOG were 61-4. 3rd game for Thailand was against Australia. This time the final score was 24-1 and Aussies won SOG 72-8. So little improvement in every game so far and also the first goal for Thailand. Don't forget that this is the first international tournament for Thai national team. Their 4th game was against another debuting team, New Zealand. New Zealand was the weakest team after Thailand in the tournament and compared with other games, this was relatively tight despite the winning margin was clear. New Zealand took the lead at 10.10 in the 1st period but only 50 seconds later Thailand tied the game 1-1. It was the first time in the tournament Thailand wasn't trailing when the opponent had scored before them. That joy lasted only 58 seconds when New Zealand took the lead again. New Zealand won the game 12-2 and outshot their opponent clearly 55-11. That was still the best performance by Thailand so far in the tournament. Yet they had to face South Korea who was fighting for gold medals. Before the final day South Korea and Japan were tied in points but the Japanese goal difference was much bigger, thanks to 58-0 win over Thailand. Before the final day the goal difference for Japan was 123-2 while South Korea had only 56-4. Japan was +121 and South Korea was only +52. Japan had their final game against China which was played after South Korea-Thailand. Japan was +69 goals ahead of South Korea meaning they would have to score at least 80 goals to put Japan behind them in the standinds with the assumption that Japan won't destroy China. Korea knew what they had to do against Thailand and they did more than enough. There are columns for 22 goals for each team in the official score sheet. The first page was full when only 12.33 was played in the 1st period. The score in the first intermission was unimaginable 36-0. Think about it. 36 goals in first 20 minutes of play. There's absolutely no sense. 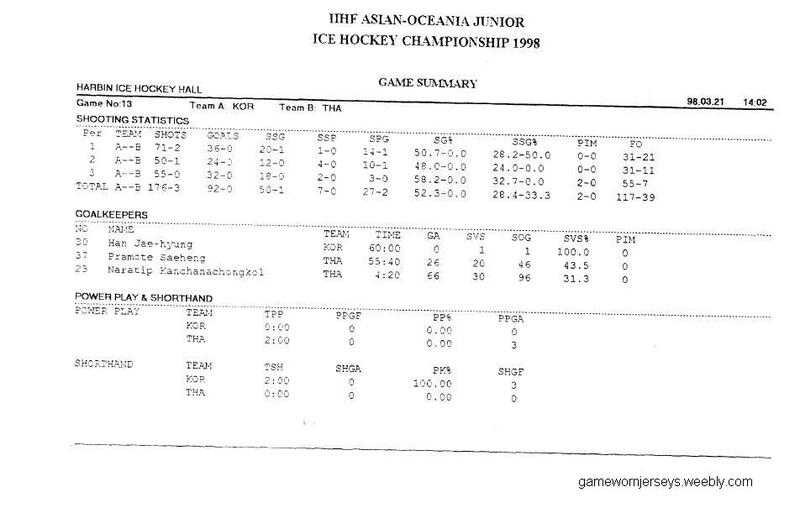 SOG in the first period were 56-1 so the Koreans' scoring % was more than excellent. South Korea continued where they left and it took only 22 seconds in the 2nd period for them to score the goal # 37. South Korea took their foot slightly off of the gas pedal and the score after 2 periods of play was 60-0. The Koreans were now only 9 goals away from Japan to tie with them in the goal difference comparison. But as said earlier, that won't be enough if and when Japan beats China. Koreans used less time than in 2nd period to score their period opener in the 3rd. This time it took only 20 seconds to start the rally towards the gold medal. South Korea didn't allow a single shot in the 3rd period while they bullied the Thai netminders scoring 32 goals in the final period. Last of them at 59.16. The Zamboni driver had to only clean half of the ice meanwhile the score sheet keeper was wishing to be somewhere else than writing down all the goals and +/- statistics. The final score was 92-0 and total shots on goal were 142-1. All those goals required 5 score sheet papers and that can be seen in the Hockey Hall of Fame in Toronto, Canada. Something about the game tells the length of the periods. The first period lasted 40 minutes, 2nd period also 40 minutes and the 3rd period 42 minutes. With 15 minute intermissions the game lasted 2 hours and 32 minutes. Pongopl was on the ice during the first and last goal of the game and depending on how to interpret the plus-minus statistics, he was on the ice during at least 28 of 92 South Korean goals. The Chinese statistics keepers must have gotten tired since they have marked many of the Thailand's minuses to players who are not even in the lineup for instance #12 got -22 but he's not in the lineup. Even the time of the game's first goal is marked as 4.41 but time of the 2nd goal is 3.05. The plus-minus keepers have written the numbers on a paper after every goal and the score sheet keeper have filled the numbers during intermissions so he has probably misread some 17s to be 12s. So in worst case scenario Pongpol got devastated -50 rating in the game if that is the case. The worst rating was according to my calculations -49 so if all those falsely marked #12's minuses belong to #17, he has probably the worst plus-minus rating in one game of international hockey history. Another notable thing is that there was only 1 penalty called in the whole game. It was taken by the best point scorer in the game, Dong Hwan Song, in the 3rd period. South Korea scored 3 shorthanded goals during that penalty. Mr. Song made a record which may never be broken. He scored 30 goals and gave 5 assists in the game and that stands still for most goals in an international game. This result was more than enough for South Korea. Japan won China 7-1 meaning South Korea would win the tournament. Thailand wore the white jerseys in all three games in that tournament. The jersey itself is absolutely gorgeous. THAILAND and Thailand Ice Skating Association's patch are sewn onto the jersey. The Nike logos in the front and back, the IIHF patch and the nameplate are also sewn. Individual letters and all numbers are heat pressed. As you can perhaps see from the photos, the back numbers and letters are in horrible condition. When I received the jersey, plenty of the white plastic from the numbers had fractured to the bottom of the plastic bag in which it was sent. The numbers are typical double layer so the top layer has suffered most. It's not even possible to breath towards the numbers without seeing some more pieces of plastic to fly away. The jersey was stored in Thailand so I guess it has been preserved in rather hot and moist conditions which have affected the plastic's form. The jersey is definitely among the most valuable and rarest jerseys in my collection. Despite the weak condition of the numbers, it's still very stylish and beatiful piece of Thai and international hockey history and I'm extremely proud and lucky to own it. 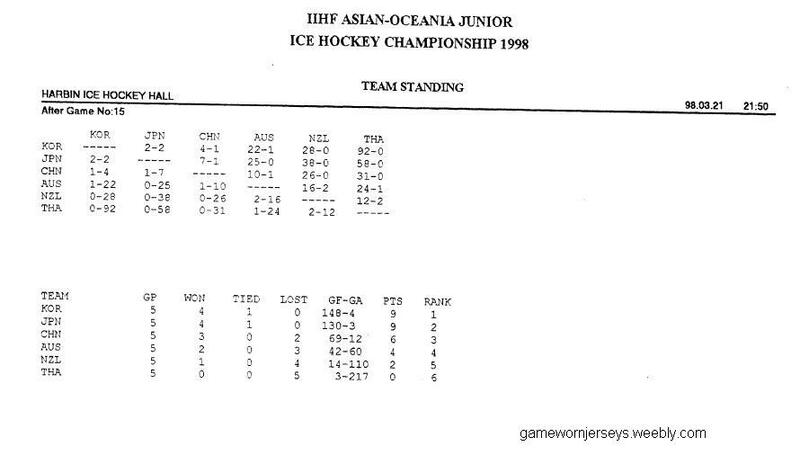 Below are the statistics from South Korea-Thailand game and the final results of the 1998 tournament.